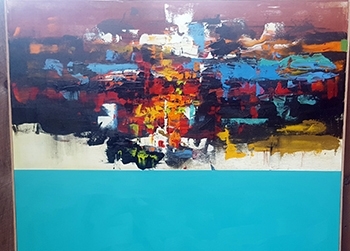 Indianapolis artist Bruce Armstrong used paint and the free-form artistic process to create the large, bold paintings titled “Abstraction Plus,” layering colorful paint on his canvases – representing freedom from restraint, and unpredictable nature of where art can take someone. He describes his process as “a ship on the sea being blown by an artistic wind. About the Artist: Armstrong’s love of art began at Crispus Attucks High School in Indianapolis, and flourished across the years to create imaginative pieces that have adorned the Chicago Museum of Science and Industry, the Indiana Landmark, and the Indianapolis Public Library.